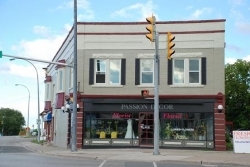 Home > Ontario > 3 florists in “Barrie” > Passion Decor Florist Inc. Passion Decor Florist style is modern and sophisticated. 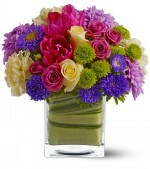 Our flowers are vibrant, exotic and presented in an unusual and artistic manner. Selling flowers at our location for more than 20 years. We are committed to providing superb customer service. 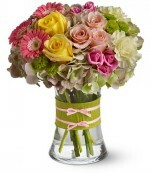 We look forward to receiving your flower order online. Our hours of operation are Mon-Fri 11:00am-6:00 pm. Sat 11:00-3:00 pm. Closed Sundays. 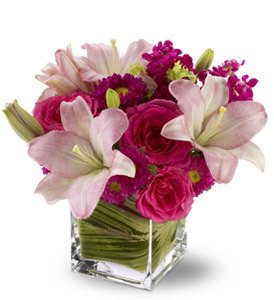 Pink lilies, roses, asters, and variagated foliage in a square vase. 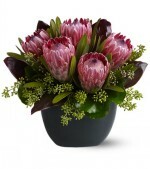 Five gorgeous, long-lasting, unusual protea nestled in seeded eucalyptus, galax leaves, and ti leaves. Hot colour combo - orange and fuscia! 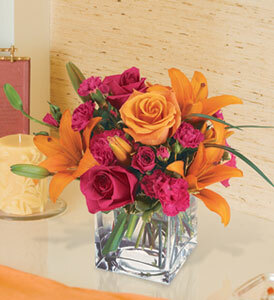 Orange tiger lily, fuscia and orange roses, and mini-carnations in a square vase. 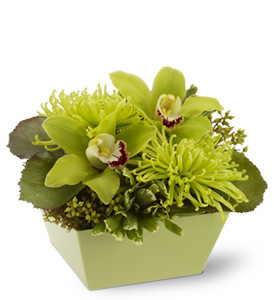 Cymbidium orchids, limes, berries, and kermit mums - monochromatic and suitable for any office or thank you gift. Dramatic ti leaves edged in red, anthiriums and roses are simple, clean, and quite striking. Striking visual impact. 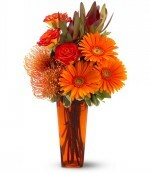 Birds of paradise, flax leaves, berries, and croton leaves with limes nestled in the base. Line & form. Graceful & modern. Orchids, equisetum, and berries. 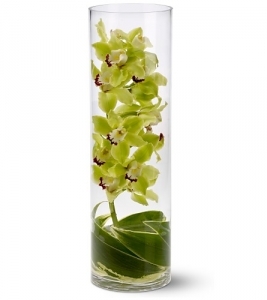 Exotic mokara orchids arranged in curly willow in glass - simple, long-lasting and unusual. A variety of tropical flowers and foliage - heliconia, ginger, protea, oncidium and dendrobium orchids, anthiriums, and flax leaves. How impressive! Show your loved ones just how much you cherish all the moments with this beautiful sprayOne spray on an easel arrives decorated with white gladioli, snapdragons and stock, accented with red carnations. This lovely heart-shaped design will leave no doubt just how much love you want to show family and loved ones. Each spray is created with lavender chrysanthemums, white daisies, yellow alstroemeria, pink asters and spray roses. Since peach is one of the most naturally comforting colors, this half-couch spray is sure to provide plenty of comfort to all those who care. A half-couch casket spray is delivered decorated with peach gerberas, larkspur, lilies, roses, stock and camellia, along with emerald palm and sprengeri. Tribute in a grand manner, send this impressive arrangement of white flowers. They’ll convey exactly how you feel.